A while back Tofu, Tofu's Roomie(need to give her a nickname), and I went out to the movies and grabbed lunch nearby. We were up in Aliso Viejo and debated on where to go. 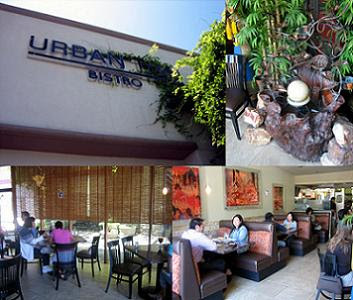 I have been to Urban Thai Bistro a while back so I named it as one of the places to eat here. They decided that they wanted Thai so we came here. I have to get this off my chest. What is up with the name? It's like an oxymoron! The decor is pretty nice and woodsy. It was pretty packed that Friday for lunch. To start off the meal I ordered Thai Iced Tea and they ordered Thai Iced Coffee. We ordered the lunch specials and they came with soup. It's their daily sou with Rice, Garlic Chips, Shredded Pork, and more. This was surprisingly good. I really liked the flavor and taste. The garlic chips really gave a great crunch to the soup. If I knew I would have rather had a whole meal of the soup versus the main dish. I ordered the Spicy Fish Fillets. It's fried Fish fillets mixed with a variety of colorful Vegetables in a Sweet & Spicy Sauce. There was barely any fish in the dish. The flavors were not bad but I didn't like how it was just pure vegetables. It was a little too sweet. This really wasn't that memorable. Like I said, I wish they served the soup as my main meal. Tofu got the Chicken Pad See Ewe. It's Flat Rice Noodles, Asian Broccoli, and Eggs. This was only so-so as well. It lacked flavor and was a little overcooked. The plating was a little lacking as well. It looked like the food was just flopped on and left there. Tofu's Roomie ordered Yellow Curry Chicken. It's Coconut Milk, Eggplant, Potato, and Basil. The flavor was a little bland yet again. I really liked the dish they presented the food in. Usually when I eat curry I like drenching the rice with sauce. All in all the food isn't anything memorable. I am not too surprised since I am in Aliso Viejo. At least the prices for lunch are reasonable. It's better to come here for lunch than dinner because it really isn't worth the price. If you are open to other types of food then go elsewhere. I don't think I really would be back to this place unless a friend drags me there. This restaurant sucked. The dishes had a disgusting smell to it. I told them to give me the check and left.I even found a cockroach on the floor. I am sorry to hear that you had such a bad experience! Eww a cockroach! You should call the Health Department. I didn't like their food either. There are so many better Thai places down here. Like I said, aim for another restaurant in the area.